Prothane Ball Joint Boot replacements work on factory 94-04 Mustang ball joints and all 79-04 Mustang UPR A arm Ball Joints. The factory ball joint boot are prone to cracking with age or being cut from normal wear a tear. 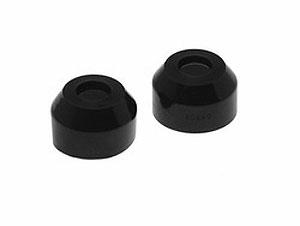 These replacement boots are made from high grade urethane and will protect your ball joints for years to come. Installs in 1 to 1.5 hours using normal hand tools.